If something is undervalued for good reason, then it isn’t undervalued. This is certainly true to some extent in Japan. It’s not a coincidence that a majority of Japanese companies have a very large cash balance: it’s the result of a country wide culture of poor capital allocation. So buying cash at a discount with a small operating business attached never sounded very attractive to me. You should expect that the company continues to sit on the cash balance for years or even decades while earning shareholders almost nothing in the mean time. I expect that eventually corporate capital allocation will improve in Japan, but that could be an event that happens outside my investment horizon. 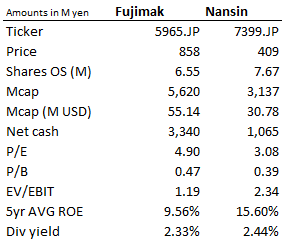 Since both companies are located in Japan and I don’t speak a word Japanese my analysis of both companies is superficial at best and purely based on the financial statements of the past 5 years. It is totally possible I’m missing something important. That’s why I initiated two small positions, and I might add a couple of other names in the future to create a small basket of similar priced Japanese stocks to diversify my risk. This entry was posted in Portfolio and tagged 5965.JP, 7399.JP on August 8, 2014 by Alpha Vulture.